It's December 7th and I know of several of you that haven't even started your Christmas cards this year and I want to be the first to tell you, don't sweat it. I've got you covered. You've ordered the supplies and stocked up on this Candy Cane Lane Paper, and it's a good thing because this paper was SOOO popular that it's already sold out…but now you are stuck for ideas.This is the easiest, cutest, fastest Christmas card out there…and you could start it on Dec 22nd and still get it in the mail! Ok, you've got to fussy cut a bunch of houses, but you can do that while you are watching sappy Christmas movies this year. Here it is! And if you need a quick little crash course on this Z-Fold, check out my video! If you didn't stock up on that paper, bummer! It was so stinkin' cute..I may have a few houses I could share with you if you need just a couple of cards. Call me… But you are creative, you are a stamper for Pete's sake, and you could certainly "adapt" this card. 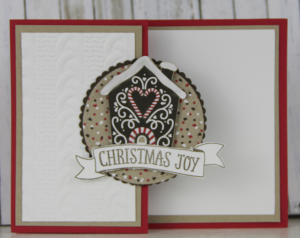 Use the Cookie Cutter Christmas stamp set to change it up and you've got another really quick card. There is the coordinating punch for those of you that have a phobia of scissors and hate fussy cutting. This was actually a card we did for my Christmas Card Stamp A Stack series…watch your newsletters for my Birthday Card Stamp A Stack series coming up in the new year…don't worry about that yet…just get your Christmas cards done and we can move on to the new year.